Also known as The Cheat with the Ace of Diamonds. Two versions of the painting circa 1630 and 1635. 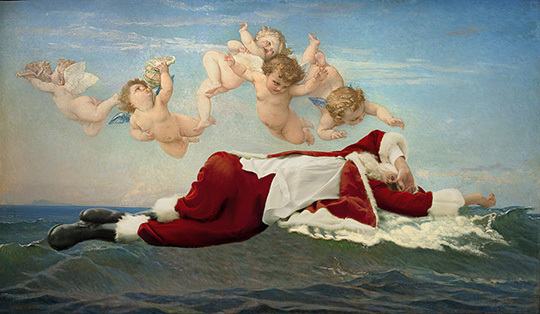 The version I have placed Santa in is from the Louvre. The other version is in the Kimbell Art Museum, Fort Worth Texas. The Texas version is called The Cheat with the Ace of clubs because in the second version he changed the suit of the cheat card from a diamond to a club. This painting is a direct reference to The Cardsharps by Caravaggio (see blog post Dec 7). De La Tour was one of about 50 artists who showed there admiration for Caravaggio by copying this work of art. Van Honthorst was a Dutch Golden Age painter from Utrecht. He painted for several royal families in the Netherlands, England and Italy. He was strongly influenced by Caravaggio and chiaroscuro receiving the nickname "Gherardo delle Notti" (Gerard of the night). He made a number of paintings of musicians, both as individuals and in groups.